Bucking a central tenet of biology, researchers at the University of California San Diego and their colleagues have discovered evidence for a new path of evolution, and with it a deeper understanding of how quickly organisms such as viruses can adapt to their environment. Describing their findings in the March 30 issue of the journal Science, UC San Diego biologists conducted a series of experiments with a bacterial virus and found that it could infect "normal" hosts, as expected, but also—through a process previously unseen in evolution—acquired an ability to infect new host targets. The researchers say their findings, which address longstanding mysteries of how genes acquire new functions and how mutations arise to ease transmission from one host to another, could be applied to investigations of viral diseases such as Zika, Ebola and bird flu. 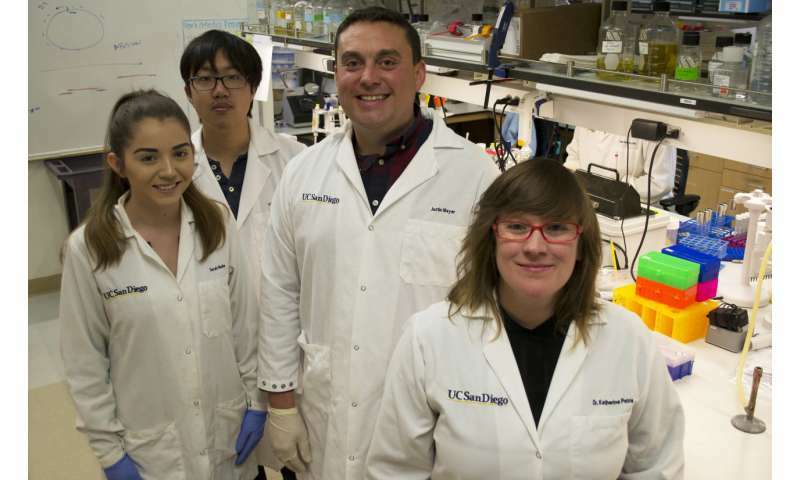 "This research shows us that viruses are much more adaptable than previously anticipated," said Justin Meyer, a UC San Diego Biological Sciences assistant professor and the paper's senior author. "By learning how viruses achieve evolutionary flexibility, we have new insight into how to set up road blocks to stop the emergence of new diseases." Viruses infect by attaching themselves to molecular receptors on the surface of cells. These receptors are the "locks" that viruses must open to enter cells. The "keys" to the locks are viral proteins called host-recognition proteins. Researchers working in this area have focused on how mutations alter these protein keys—and what changes allow them to access new locks. Scientists have known for years that viruses can gain new keys with relatively few mutations but they have not solved the mysteries of how these mutations first appear. This question led to a collaborative effort with researchers from UC San Diego, the Earth-Life Science Institute in Tokyo and Yale University. Katherine Petrie in Meyer's laboratory led the project's experiments on lambda, a virus that infects bacteria but not humans and allows broad flexibility in lab testing. The researchers found that lambda overcomes the challenge of using a new receptor by violating a well-accepted rule of molecular biology through which genetic information is translated into a protein—the molecule that makes up living cells and viruses. Petrie and colleagues found that a single gene sometimes yields multiple different proteins. The lambda virus evolved a protein sequence that was prone to structural instability that results in the creation of at least two different host-recognition proteins. Fortunately for the virus—but not its host—these different types of proteins can exploit different locks. "We were able to capture this evolutionary process in action," said Petrie, the lead author of the study. "We found that the protein's 'mistakes' allowed the virus to infect its normal host, as well as different host cells. This nongenetic variation in the protein is a way to access more functions from a single DNA gene sequence. It's like a buy-one-get-one-free special for the protein." The researchers are now looking for further examples of their newly discovered evolutionary phenomenon and seeking evidence for how common it is. They are also moving down in scale to probe the details of the new pathway to focus on the processes of individual molecules. 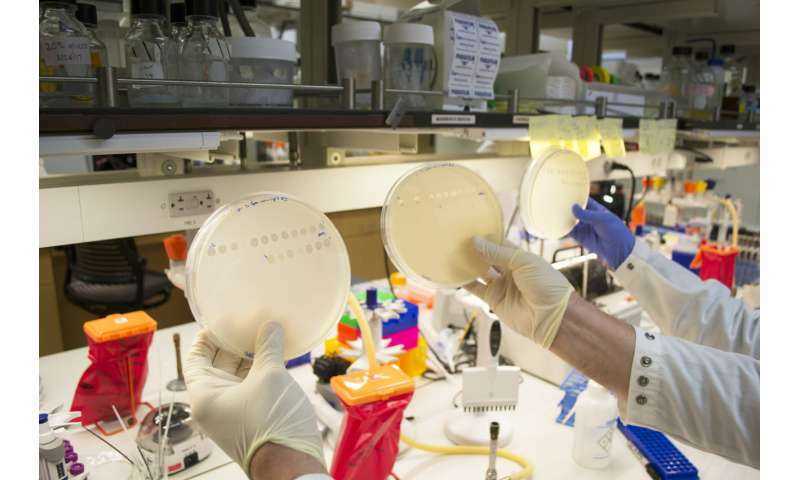 "This is a very atypical adaptation in that it's an evolutionary innovation," said Meyer. Oops... I guess those creationist dudes just took another one tween the eyes.